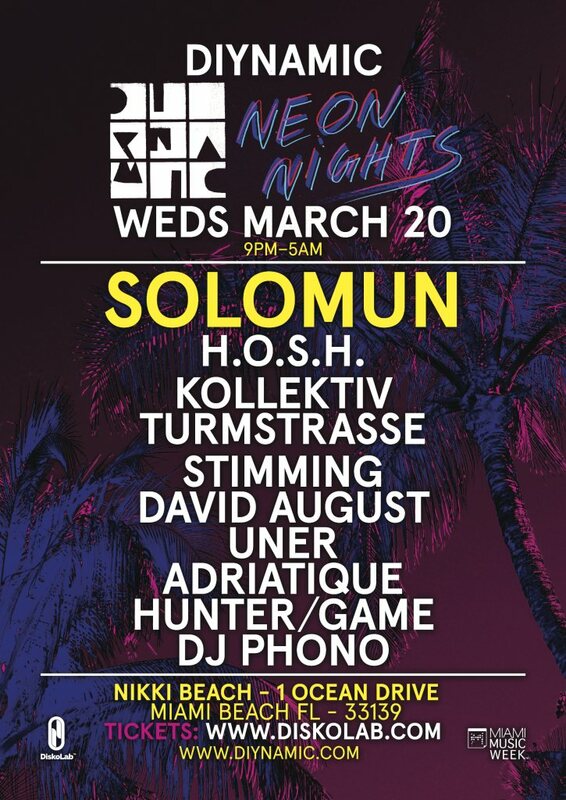 Diynamic Neon Nights arrives in Miami, to play Nikki Beach on March 20th, for their first ever event in the USA. 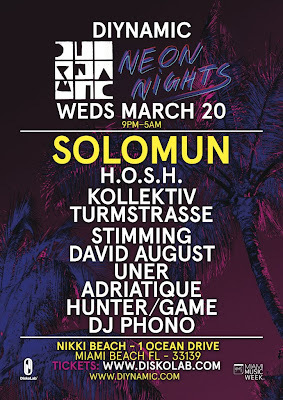 Label boss Solomun – who has enjoyed his busiest year to date, including being voted as ‘DJ Of The Year’ in Mixmag - will headline, and will be bringing over most of the Diynamic crew from Europe - H.O.S.H. * Kollektiv Turmstraße * Stimming * David August * Uner * Adriatique * Hunter/Game * DJ PHONO – playing music to make you move. Founded in 2006, the Hamburg based imprint has put out over 60 releases and gathered a family of more than 15 artists. Holding a strong DIY ethic, the label and its events have grown in recent years. Last year they took Diynamic Neon Nights to Ibiza for the first time, holding a weekly residency at Sankeys Ibiza, which quickly became one of the most talked about nights on the island. This year Diynamic Neon Nights return to Sankeys Ibiza, every Tuesday from 9th July – 24th September, check www.sankeysibiza.com for more information. Diynamic will also hold its first festival in Amsterdam, on May 18th at Arena Park – check www.diynamicfestival.com for more information. Music wise, adding to the already strong repertoire, the label’s most recent releases include: ‘Diynamic Neon Nights Sampler Part 2’ – a four track Various Artist EP from Adriatique, Solomun, NTFO and Betoko, a new EP from Ost and Kjex and forthcoming, will release the debut album ‘Time’ from David August, released April 8th.